John, you are an artist when working with stone. Maybe a very tired one, but none-the-less a true artist. I wanted to be a landscape artist but no one told me I should use a brush. 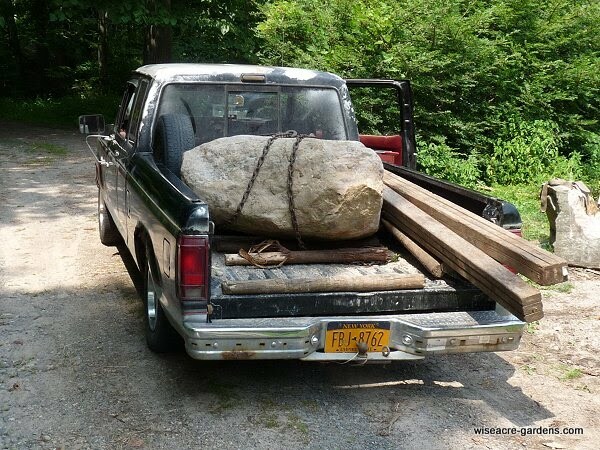 OK, I’ve been working on a pond like that for umpteen years, but lack of funds and the need to smuggle a few flat stones into Michigan with every NY trip keeps progress slow. I love yours. Sometimes I think it takes a stone person to truly appreciate what you do. If you have the time or the strength, there is a vermilion fungus on my blog that I would like you to identify. It’s just one post back. Now everything is white here much like it must be at your place. I am so surprise to see how a magician has turned those stones into a wonder. I’m a little late commenting. I just now saw that you have a new post. It’s good to see that you’re back. I’ve missed your posts. I’d love to be able to do what you do with those stones, but it obviously takes a lot of talent and a lot of work. Nice to see you (and Stewy) back again. Lovely, and darned impressive, too.